Note the missing rifle bolts in the video capture above. David Codrea reported on February 9 that a United States Marine Corps source forwarded an email to the Gun Examiner stating that soldiers marching up Pennsylvania Avenue in Obama’s inaugural parade had the bolts removed from their rifles. 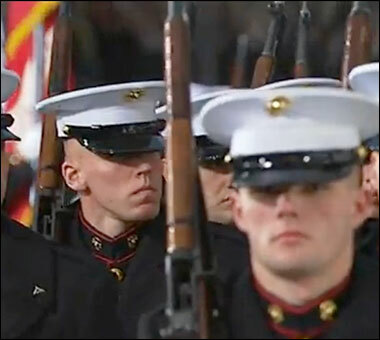 “Apparently Obama’s Secret Service doesn’t trust the USMC. Simply searching each guy to make sure he didn’t have a live round hidden on him wasn’t enough, they had to make sure the guns were inoperable,” the Blur-brain blog wrote on February 8. Is it possible that the notorious “litmus test” reportedly used by Obama to determine what military leaders must stay and which must go has experienced some sort of reversal? The test was allegedly concocted to determine if the military will fire on U.S. citizens.